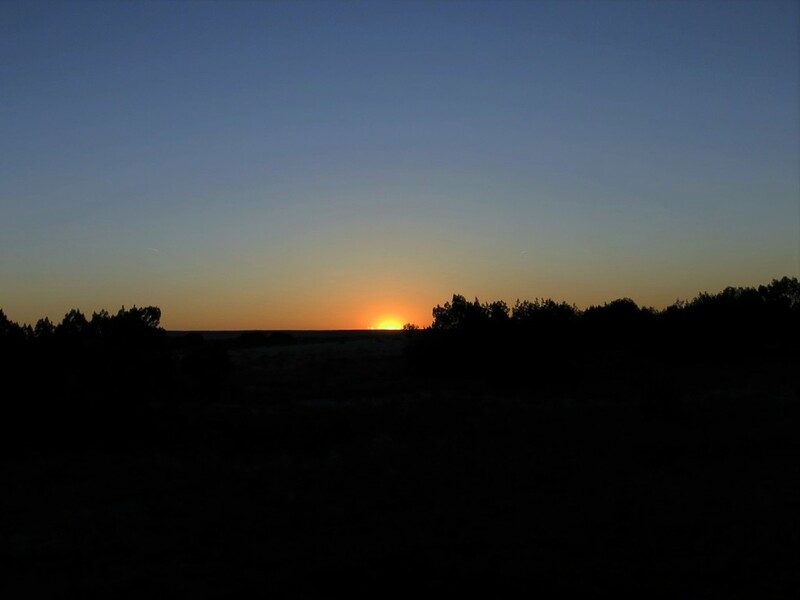 Sunset from two weeks ago at Comanche National Grasslands because every post deserves one photo. I took a hike yesterday afternoon in the foothills before the snowpocalypse began. As I parked at the South Mesa trailhead I set out at exactly 2:00 in the afternoon. I threw on my pack with temps still in the 50’s. I adjusted my trekking poles on the fly and bid hello to a ranger a few hundred yards down the trail. In reality it was actually goodbye because I wouldn’t see him again this day. I had an intended loop to complete by early evening. I make my way up the Towhee Trail, which is less traveled, and merely a few minutes farther than the Homestead Trail I normally take. Robert Frost would be proud. The tread is smooth, newer due to reconstruction after the floods of 2013 and allows me to survey the draw to the south. There are hints of spring in the dreary, grey afternoon as wild plum begin to flower on the opposite hillside. Along the trail I notice with pleasure wildflowers of violet and yellow. Across the drainage I spy two hikers on the trail I did not take. I head farther up toward Shadow Canyon, my poles clicking on the for now dry, firm trail. I contemplate collapsing the poles so that I can listen to the surroundings in tranquil solitude but opt for the rhythm to keep my pace and try to gain the ridge up high before the storm begins. I pass dilapidated structures that I have seen many times over the years. I remember all the spots on hillsides where I have seen deer in the past and I check every one knowing they will not be there today, for it was the past and history does not always repeat itself. As I enter the junction to the dark, cavernous reaches of aptly named Shadow Canyon I quickly drop my pack to check my mileage. I’ve covered 2.48 miles and my pace is 3.1mph. If I traverse the route I intend to take I should be back to the car by 6:00. I sling the pack back on and head up the dark and ominous trail. This canyon is rocky and narrow, much like one mile of constant stair steps created by an architect with a warped sense of humor. Rhythm is not a word that comes to mind when either ascending or descending the depths of Shadow Canyon. I often come down it more than go up; climbing it is actually easier on the quads than the eccentric contractions required for descending. I notice the drops first as they spot the rocks before I hear or feel them on my face. Because of the footing, my focal point is directly into the trail ahead of me and not around me as it was earlier. I stop and look. I see the rain coming at a 45 degree angle in the canyon. I continue up. Shortly, it is a mix of rain and now graupel which aspires to turn into snow, but not yet lacking the maturity to do so in warmer temperatures. All of this moisture makes for more treacherous footing on the rocky trail. I contemplate moving forward regardless of the situation. But I do not want this to become an “epic adventure”, merely an opportunity to be outside knowing that tomorrow will bring respite during the anticipated “moisture event” to hit Colorado. Yet, it is with a sense of defeat that I retreat back to whence I came. I pop out with a view of the Boulder Valley and Eldorado Canyon. I decide that putting on a rain shell is a good decision. I make a mental adjustment from completing my intended loop to now enjoying a stroll back to the car. I head in a north east direction toward the Mesa Trail. I notice that a storm of two weeks ago did occasional damage to the trees in the area. The two feet of snow was not discriminatory regarding its attack on various woody structures. Junipers, pines and deciduous woods alike glisten with white, which stands out in stark contrast to the dark, dreary, grey afternoon. It is not everywhere but is frequent enough that it catches my attention. The contrast is abrupt enough that it causes me to mentally pause and reflect. The injurious white is much like an exposed fractured tibia, so sharp as to make it difficult to look away, almost being able to hear what it must have sounded like as the branch broke under the weight of a heavy spring snow. The weather is not conducive to good photos and I am more interested in keeping my eyeglasses from getting drops of rain on them. I have double protection of a billed cap and hood of my shell to ward off the rain of the lower elevation away from the protective canyon. I opt for yet another trail that I would not normally take and it is gentle and open. I now notice the scents of a wet spring forest, like those that cosmetic companies attempt to reproduce for manly colognes attaching names like “Woody Pine” and “Twilight Woods”, certainly dreamt up by a marketing professional sitting in a cubicle or office with incandescent bulbs glaring overhead. Adverse weather insures that I don’t have to compete for space on the trail with such dolts. The contrast between the earthy, musky scents of juniper, humus and pine comparable to the sweet, fragrant wild plum is amazing. It creates confusion in my brain. The lack of heat and sunshine brings about an almost greater sense of smell in the afternoon. I’ve seen maybe half a dozen different wildflowers today and think that the coming moisture will create a riot of color in the weeks ahead. Nature’s color palette will be splendid. As I descend lower I see some sand lilies, there are fewer of these today than the other flora I’ve seen. Fauna is non existent this afternoon. I thought that perhaps they would be feeding before the weather system moves in but it is not the case. I have read that the bears have begun exiting from their dens and a long winters nap. I hope to see one, knowing that they will be foraging wildly to replenish burnt calories from snoozing for so long. I’m disappointed to not bump into one and think that it will be two years in late June since I’ve seen a black bruin in the forest. I notice that the temperature has dropped since I left a few hours ago. My trek is not as long as I had intended but as I feel the cold on my bare hands I am fine with that. I see a few other folks coming down the various trails and hills and as I enter the parking lot, now with the ranger gone, there are less cars than fingers on my one hand. Wet days, much like hikes before sunrise, make for quiet times in an otherwise busy trail system in the outreaches of Boulder city. My thoughts now turn to an evening at home, some hot food and contentment going into my own hibernation of the weekend with a book by David Sedaris. This entry was posted in Solace, Trail Time by Matthew. Bookmark the permalink. very nice. very much like my quick hike earlier yesterday. I gotta get u reading Ed Abbey’s desert solitaire. like you, he is great at describing his surroundings.